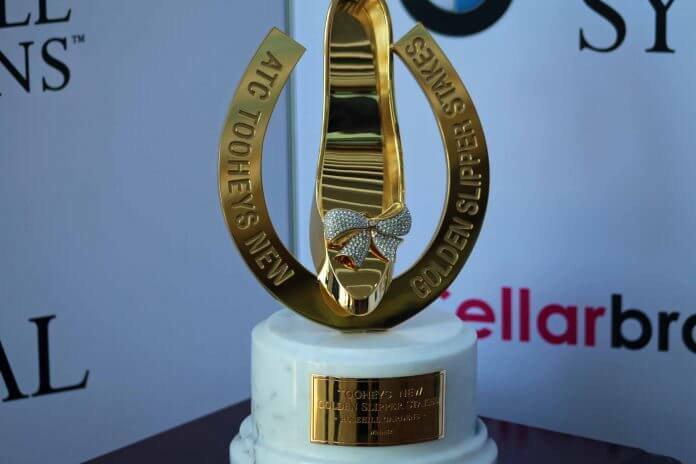 This year’s Golden Slipper may lack the class of previous editions, but I can’t recall a more interesting betting race with so many variables in play. It seems you can make a case for most runners and still find plenty of reasons to oppose each. A wet few weeks combined with an ugly forecast should see a track on the worse side of slow at best. Rail in the 3m position generally means the riders will be looking to get off the fence on an affected track. This is often overdone so cutting the corner is still the preferred option for those back in the field. Looks to be a solidly run race, with pace drawn all across the track. Houtzen has to push the button to cross, but won’t get there easy with Teaspoon, She Will Reign, Veranillo, Madeenaty and Formality all capable of showing good speed. This combined with the testing surface means I’m looking towards the runners sitting off the speed and capable of running a strong 1200m. Tulip is the runner that ticks a few boxes. I was quite taken with its win last Saturday. She jumped well, then was taken back and caught wide without cover. When asked for the effort in the straight she responded with very good turn of foot on the wet to record a dominant win in what will prove to be a strong form race. She should get a beautiful run sitting midfield and I love the fact it will be on the seven day back up on the wet. Even though Tulip was beaten by Catchy, Periah and Formality in the Blue Diamond, it had more room for improvement. The key is its preparation: having 30 days off into the Blue Diamond then the run in Sydney before the Slipper suggests that tomorrow is Grand Final day, while the three that beat it home in the Diamond were all set for that race. Houtzen also has to peak a second time this season, but was dominant in the Magic Millions. Just not sure it has had the right prep for a solid 1200m. She Will Reign faces a task from the gate and at 1200m. Along with Catchy and Pariah peaking for the Blue Diamond, this means the four runners under double figures in the race all have queries over them in my mind. Given this, I’ll be looking to play a couple of roughies with Tulip. Menari has more ability than any runner in the race, but has had an interrupted preparation. It missed a run then failed last start when had excuses. I can see a scenario where the soft barrier then cutting the turn can really suit this race shape. Trekking resumed with a very good run in The Black Opal recording good sectionals late. It will likely go right back and be better over longer, but will be very strong late at big odds.